It's fair to suggest that Eschenbach's Paris orchestra outplays them all (...). He certainly enjoys the clearest, most up-to-date sonics. (...) This is beguilling music. Roussel belongs in every collection. Eschenbach's trenchant reading alongside the expert playing of the Orchestre de Paris upholds Roussel's claim as France's finest 20th-century symphonist. Under Christoph Eschenbach's direction, the Orchestre de Paris delivers an enormously beautiful-sounding, excellently conceived plea for this French composer. (Christoph Eschenbach's) magnificent account of the First Symphony is unsurpassed. As with his recording of No. 2, Eschenbach's accounts are highly evocative and beautifully phrased. (...) in Le poème de la forêt (...) he finds the poetry of this quietly sumptuous score. (...) What makes this newcomer recommendable is the superb playing and Ondine's first-rate sound. Christoph Eschenbach skilfully guides his players through the sylvan glades and urban landscapes of these contrasting works. 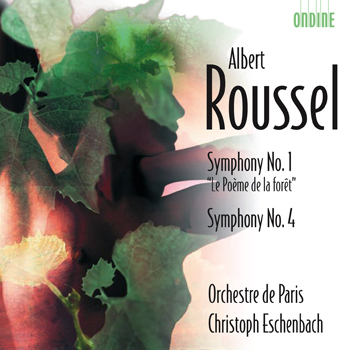 This Albert Roussel disc couples his First and Fourth Symphonies. It is the second volume in a cycle of three releases featuring the four symphonies and two ballets by the French composer, performed by the Orchestre de Paris and Christoph Eschenbach. The Fourth Symphony, written in 1934, is considered the crowning achievement of Roussel's career. The First Symphony was completed in 1906 and consists of four movements tracing the four seasons with their descriptive titles. The booklet contains liner notes written by Damien Top from the Centre International Albert-Roussel in France, as well as rare photographs.